SafeChoice® Senior gives your old friend what she needs to make every year golden. It’s specifically designed for horses over fifteen, especially those suffering from unexpected age-related weight loss, exhibiting sluggishness, experiencing issues with muscle or coat quality, or having difficulty chewing their hay. 50 lbs. 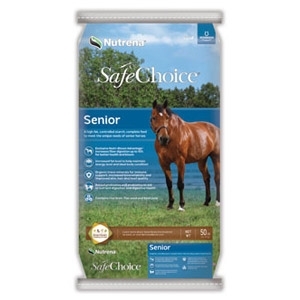 Sentinel® Senior, a Nutrient Release Formula feed, is the new generation in equine nutrition formulated specifically for senior horses, prematurely aging horses or horses with poor teeth. 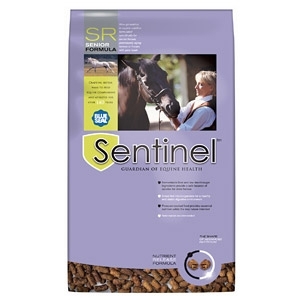 Sentinel Senior is a highly fortified balance of nutrients and an exclusive blend of natural additives to meet the increased nutritional demands of the senior horse due to less efficient digestive and metabolic systems. 50 lbs. 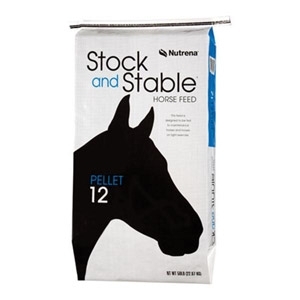 Nutrena® Stock and Stable Pellet 12% Horse Feed - 50 lbs. Stock and Stable Horse & Livestock Feeds provide a convenient, value-priced feed option that works across a range of species. Available in textured and pelleted forms, with a variety of protein levels, they provide quality nutrition for your entire farm. 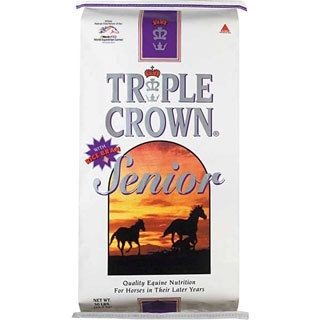 Developed specifically for older horses, Triple Crown Senior Formula Textured Horse Feed features a higher nutrient content to compensate for a less than effective digestive system. A higher fat content provides the extra energy older horses need. Plus, it is softer, more easily digested and can be mixed with water to form a mash for horses that experience difficulty chewing and swallowing.